This is the first time I’m hearing of BO Vaping, and their flagship device, an elegant-looking pod mod system, the BO One. The BO One is a very good-looking device, as far as pod mods go, with its ceramic finish and stylish design accents. The BO One is the latest entry into the popular pod mod market that has seen some great, new devices in 2017, from the KandyPens Feather and Rubi to the Envii FITT. It was an exciting year for pod mod lovers, who before this year, had very few options to choose from. For me, the BO One has a lot in common with another American-made pod mod system, the PHIX by MLV Vapes mostly because the Phix also featured an elegant, smooth ceramic finish on its mod. The BO One comes packaged with two 1.5ml cartridges filled with the more satisfying nicotine salts than the traditional VG/PG blends of most e-juices. The pods get introduced onto the top section of the mod that has two magnetic connectors on the bottom for easy charging, either through the USB attachment or a USB charging cable. The pods feature a semi-transparent plastic casing that lets you see how the pods work by slightly exposing the atomizer inside. The BO One is a very slight, and lightweight device that measures 3.93 inches in height and weighs only 22g. There are four color options that the BO One comes in; two versions are the standard black and ceramic grey, there are also two limited edition versions that feature colorful, street art designs. At the very base of the mod itself, which feels great to hold and grip, you’ll find two magnetic contacts that you can use to charge the device. There is no USB charging port on the BO One. It’s charged using this unique, rubberized cable device that attaches to the device and can then be plugged into any available USB port. There is a small, thumbnail-sized LED light on the center of the mod, which has a 380mAh battery inside. The LED light flashes every time you install a new mod into the top section, and every time you take a vape. When you are vaping, the LED light also acts as your battery life indicator, which will shine blue for a fully-charged battery, white when it’s halfway charged, and red when it needs to be charged immediately. There is also a sliver of an airflow vent on the opposite side of the LED light that allows a more open draw than most other pod mods like the Juul. An exclusive option for the BO One comes sold separately from the kit, a very slick-looking PCC with interchangeably sticker panels to maximize a personalized vaping experience. The PCC is sold independently on the BO Vaping website and can hold your BO One mod along with two additional pods. Pod mods require only the simple act of installing the pod on your mod, and then, depending on the mod taking an inhale through the draw-activated mouthpiece to start vaping. That is most certainly the case for the BO One. It is a draw-activated system, so all you have to do to begin vaping is to install one of the included pod mods that are available in various nicotine strengths from 6mg to 18mg. There’s no satisfying “snap” or “click” whenever you put in a new pod mod, you’ll only see the LED light flash once. Once you have installed your new pod mod, all you need to do is to start taking draws to get the device started. The pods are supposed to be disposable, but after tinkering with the pod a little, I was able to remove the mouthpiece section to expose a rubber stopper that you could take out to refill the pod if you are willing to go through all the work. My BO One came with the two pods prefilled with Kiwi Berries e-liquid that had an 8mg nicotine strength. Taking smooth, mouth-to-lung hits off of the mod was satisfyingly good. I indeed detected the sweet and tartness of the kiwi, while also getting a very restricted throat hit. The 380mAh battery did not last me almost an entire day, but it was more based on how often I used the pod that determined the length of my vaping session. The KandyPens Rubi was one of my favorite pod mod systems of 2017, mostly because it made sense that a trendy and stylish vape company like KandyPens apply their design acumen to creating a pod mod device. The technical specs on both the Rubi and the BO One are quite similar. They are both close to 3.93 inches in height although the BO One is slightly more powerful thanks to its internal 350mAh battery, compared to the Rubi’s 280mAh battery. Both for the versatility and well-crafted technology on the Rubi, I think we already have a winner in sight. The Rubi pods were refillable, which was a definite plus for me since the pods for the KandyPens Rubi could also be used with CBD oil rather than just e-juice. You could conceivably hack the BO One pods so that you could refill them, but they would still not be able to vape CBD oil, which was something I found more enticing about the KandyPens Rubi. I give this contest to the KandyPens Rubi for its versatility and excellent vapor production. Pod mods are the very definition of inconspicuous, stealth vaping. They are perfect handheld devices that very rarely have any portability or storage problems. The BO One was an excellent example of this compactness and durability. The 380mAh battery is another new standard for pod mods, since most devices, like the Rubi, didn’t get above 280mAh. With its significantly larger battery size, the two options to charge the device made for a speedy charging time that took just under one hour. I was never a smoker, and I basically only started vaping nicotine with the advent of vape mods, so while the BO One is not designed to be a cloud chucker, it still delivered great nicotine highs that made me unable to put the BO One down. The pods for the BO One are supposed to be disposable, but I was able to, with some effort, pry off the mouthpiece and find the rubber fill hole to reuse my pod. It would have been much better if the pods were ready to be used again. I liked the BO One pod mod for all the same reasons that I loved the Phix from MLV Vapes. It is a supremely attractive device with an easy-to-use setup, a decent battery life, and a draw-activated vaping system. I preferred the versatility available on the KandyPens Rubi, and the great performance of the KandyPens Feather compared to the seen-it-before performance of the BO One. I’ve always loved pod mods, but with the recent advent of super-small, well-performing AIO kits like the Feather or Envii FITT, pod mods do have a run for their money on when it comes to keeping up with the competition. 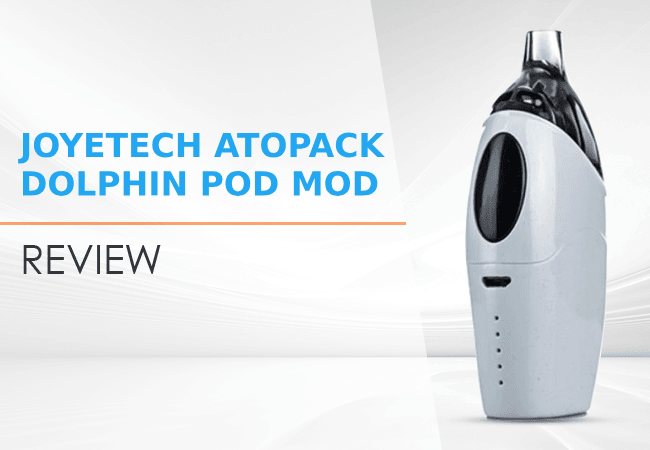 Joyetech Atopack Dolphin is a Compact Pod Mod coming with a 2100mAh battery and a new JVIC coil system.